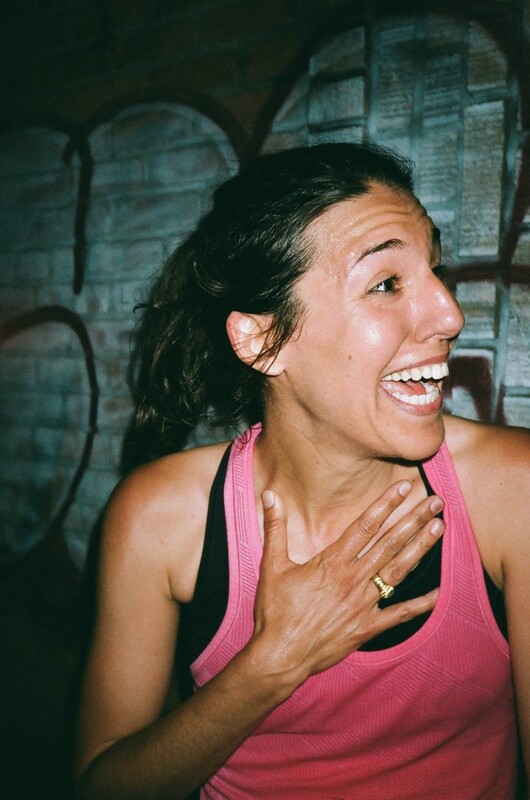 Jennie Cohen, the 2015 Female Champ, answers a few questions regarding this year’s race and shares some insight as to what the 2015 Midnight Half was like from the leading female’s POV. Featured photo by David Trimble. Jennie has run in a couple of OSR races coming in second in the 2014 Midnight Half with a time of 1:31:28, 4:39 behind the winner Leigh Gerson. She also had a second place finish to Leigh in the 2014 OSR W10K with a time of 39:04, 0:51 second behind the leader. Going into this year’s Midnight Half I was looking forward to a potential third match up between these two fast ladies. As race day approached it looked like I wouldn’t get my wish, Leigh told me she wasn’t going to run a course that was not USATF certified..but in dramatic fashion, the morning of the race Leigh signed up to defend her title. Photo by Parker Feierbach at the finish line shortly after her win. 1. How did you first find out about the Midnight Half? What had you heard about it, if anything? Darcy Budworth told me about the race. She has always been into alternative races, as I also heard about the Crit from her first. I wanted to run it a couple years ago, but by the time I decided to sign up it was sold out. Last year was my first race. 2. Did you think you were capable of winning last year? This year? Why? Last year was rough for me because I was suffering from really tight hamstrings. I didn’t feel great during the race, and I knew Leigh has just come from an amazing time at the Nike Women’s half that I could never beat even in the best conditions, so I was hoping for second. This year, I knew I had a shot, but that it would depend on finding someone to help me navigate the course, and what other girls were out there. 3. What’s your favorite context to run in, trail, street, track? I am from Connecticut and love running around the old farm towns there. It’s on the road, but surrounded by 18th century houses and farmland. I HATE trails. I’ll spot a beautiful tree or a deer, then fall and skin my knee. I go to the Dashing Whippets speed workouts on Tuesday, I do a track workout most Thursdays, and then run maybe 9-11 miles on the weekend. I’ve also been doing spinning classes once a week. My next goal race is NYRR’s Pride Run at the end of the month. I wore Nike Lunarglide 6, my third pair. I love the Nikes. It doesn’t hurt that they look great. I ran in the Asics GT series for nearly a decade, but I decided to switch when I got that hamstring injury. I wish I could tell you that I spent weeks studying and practicing the route, but that wasn’t the case. In fact, my biggest worry leading up to the race was getting lost. I don’t know Brooklyn. Last year I wrote the directions on my arm, but quickly realized the futility of reading on a dark street. As luck would have it, I went to the Dashing Whippets track meet the day of the midnight half, and I met Steve Wo (who had also registered for the race). Steve grew up in Brooklyn and knows the streets well. He also happens to be slightly faster than me, but had run in the meet and wouldn’t be going all out. If it weren’t for him, I don’t know what I would have done. He was an amazing navigator and supporter throughout the race. I always go into a race hoping I don’t go out to fast. I vaguely know that most people’s best races are negative splits. A great thing about going to the Whippets’ track meet the day of the race was that I got to see so many races play out. In nearly all cases, the guy who started first didn’t finish first. Seeing this unfold over and over was an eye opener to me. So I held back, and felt really good throughout the whole race, especially at the end. 8. Leigh Gerson wasn’t supposed to run, then she registered late. Did this effect you in anyway leading up to the night of the race, or were you unaware? Do you feel there is any direct competition between the two of you? Considering you guys have competed in a few local races, sometimes she beats you sometimes you beat her..was this a big win? I think it was, you took down the 2 year reigning female champ, and a cocky one at that! I know I was looking forward to the match up. Leigh has this great running persona and has made a name for herself in the local running scene, and I really admire that. Her best times are faster than mine, but this year so far I have raced faster than her. I will see her in the first part of the race and run with her for a bit because passing her is a real hurdle for me. 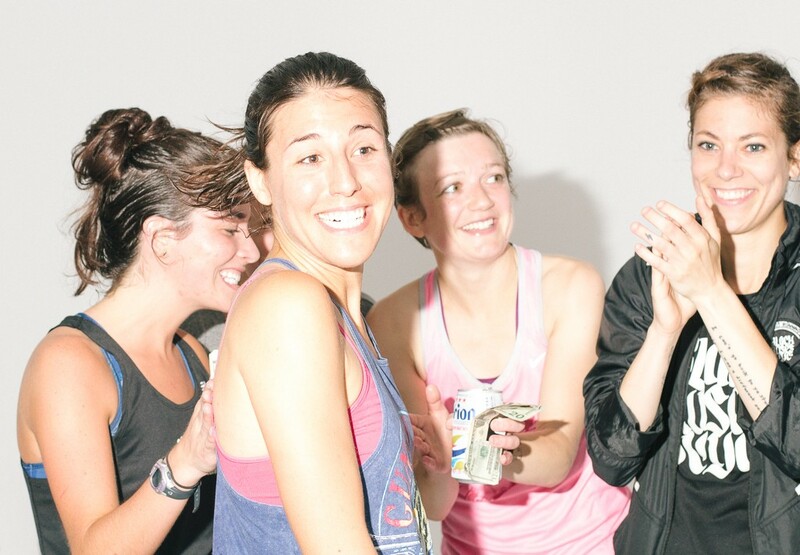 It happened at the Red Hook Crit, at the Brooklyn Half, and then again at the Midnight Half. When I found out she was registered, it definitely shook me. She is a more outwardly confident runner than I, she has a history at this event, and people have expectations for her. I thought that maybe she would have this amazing performance and take the win. Our recent races told me that I’d probably beat her, but sometime with running you never know. 9. What did it feel like to turn the corner on Ludlow, seeing the finish up ahead? What was going through your head? To my knowledge you hadn’t realized that you were the lead female, can you elaborate on the experience? My first thought was, “I hope I made the right turn” because my navigator Steve was no longer with me. Even though I passed the lead girl when crossing the Manhattan bridge into Brooklyn that last time, I was unsure definitely that I was 1st. There was a stretch in Brooklyn, during the last checkpoint, where no one was following me on the bike. And I knew they followed the lead girl. So when David Trimble met me coming off the Manhattan bridge, it was a relief, but I still wasn’t convinced. I also didn’t hear anyone say “lead female” when I crossed the finish line (that might have been me being unaware), so when I heard that I got first, I was really happy. Ecstatic, actually. 10. How did it feel to wake up the next day as the champ of this underground midnight race not many people know of? What does being the champ mean to you if anything? How does it compare to other races you have placed at or ran? It’s great to win a race that is a much cooler event than your standard NYRR Central Park, up-before-everyone-else race. This is a race with a downtown feel: there are more tattoos than garmins, coconut water rather than Gatorade, and the race is at a much sexier hour. Then you have all the photographers and the streets of the city as a background. It’s great to be a part of that, and to have won the event feels even greater. 11. Will you be back to vie for the title next year? If so, where do you hope to be in terms of your fitness level compared to this year? 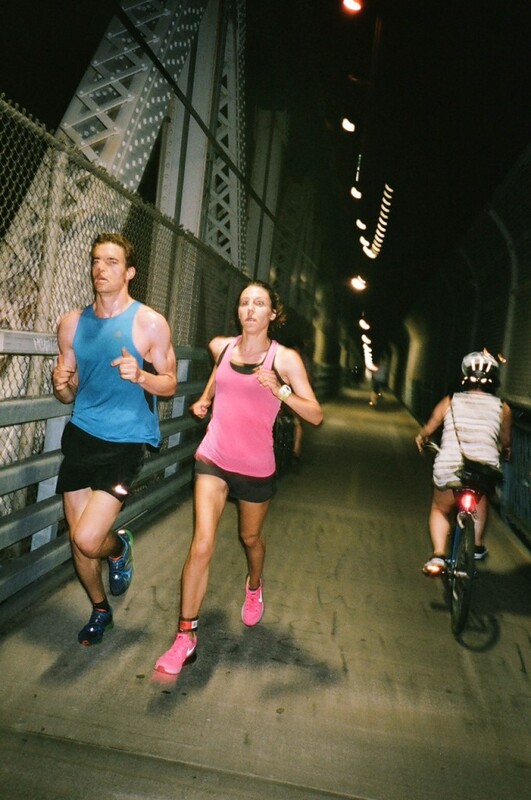 What will you do differently to prepare – having the experience of more than one Midnight Half under your belt? I plan on it. Every year I get slightly faster, so I’m hoping that next year I can beat my time if the course stays the same. I think I prepared really well this year, and would do the same: take it easy the week prior, eat a lot the day of the race, and have a coffee about an hour before the gun goes off. The difficulty in the Midnight Half is the uncertainty of the route. I agonized over getting lost, and normally I just agonize over not running a good time, or dropping out for some reason. The gratification is there because it is a local event that local runners have their eye on, and there is prize money.